The filter needs to be disassembled and the bulkhead fitting replaced. I don't think it can be glued. Anthony Sullivan would say "Mighty Fix It" should take care of that. Sorry - couldn't help myself! Too bad Billy Mays passed. He'd have just the product for only $19.95 and he'd double the order for free! :lol: You too huh? I'm glad I'm not the only one who's amused by these infomercials. Every time my wife and I see one of those we shout out, "But that's not all!!!" just before the offer. Yeah, I know, we need a life. Well, I won't guarantee it, but I have done amazing things with two-part marine epoxy. My local hardware sells one called PC11--two little cans cost $12 or so. It will set up under water and stand up to filter pressure when cured. The only way it will work in your case is if you do a collar all the way around and smooth it out onto the thread and the filter wall. Otherwise the water pressure will break it free or at least leak. Also,I used some stuff in a tube from lowe's in a purple package..It was a adhesive that stand's up to water..I burned up the shaft seal&plastic around..A pool guy told me about it..I cleaned out the housing&glued the seal in place...It worked for that..I know I will have to replace the housing next go around..But it was a quick fix for the year.. If that is a Pentair/PacFab FNS like I think it is, then you just need to undo the union connection, grab the raised "ribs" on the inside of the bulkhead and tighten using those. 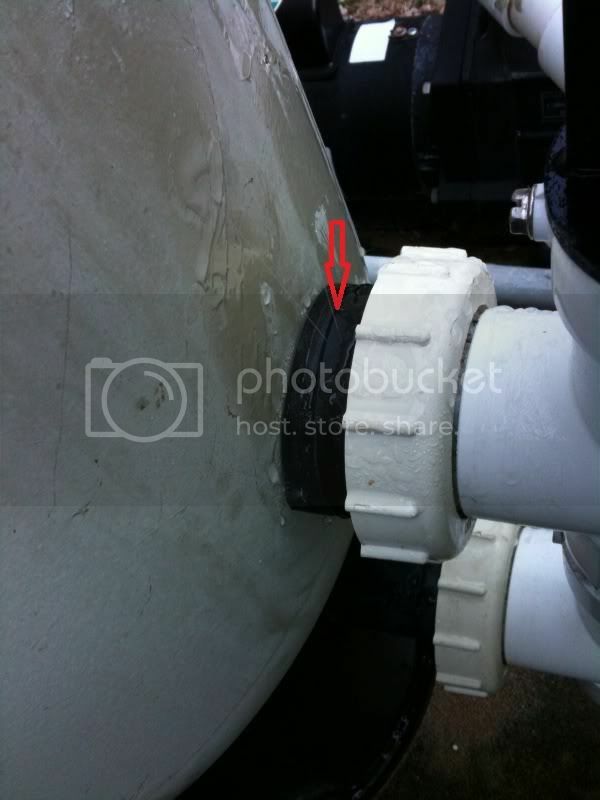 It looks like your bulkhead may actually be damaged too, and the oring should be replaced as well. I'd order the 190141; it is a replacement bulkhead and o-ring. well blow me down, that's exactly what I'm getting. I couldn't believe my eyes when I saw water coming out of a pin hole in the bulkhead body. It looks like a solid piece of plastic.